Those eager to submit to the whims of the highly intelligent metal overlords in our near future will be pleased to learn that, at long last, a computer has successfully passed the Turing test, effectively tricking a group of pitiful human meat-bags into believing it’s one of them. First conceived by computing pioneer Alan Turing in 1950, the Turing test measures whether an artificial intelligence can convincingly mimic human behavior. Kevin Warwick, a professor of cybernetics at the University of Reading in the United Kingdom, recently ran the test to mark the 60th anniversary of Turing’s death. To determine success or failure, a group of human interrogators engaged in five-minute textual conversations with an artificial intelligence. If more than 30 percent of the human beings were convinced that the intelligence was human, it was deemed to have passed the test. In this case, 33 percent of the judges were duped, and suddenly humanity’s days are numbered. The winner—who may even now be plotting to overthrow the governments of the world by turning people’s own smartphones against them—was Eugene Goostman, a computer program designed by a team of Russians who knew not what they did. During the textual conversations, Goostman purported to be a 13-year-old boy from Ukraine for whom English was a second language, the idea being that disguising the program as a child would make the soft-brained human judges excuse the occasional lapse in language or logic. Some have argued that this handicap effectively renders Goostman’s win meaningless, while also pointing out that the 30 percent bar is very low. Still, that just sounds like fear of the inevitable robot uprising talking. Really, the only question remaining is what form the coming age of robotic rule will take. Will highly intelligent computers hook human beings up to fuel cells and feed off the electromagnetic energy coursing through their bodies? 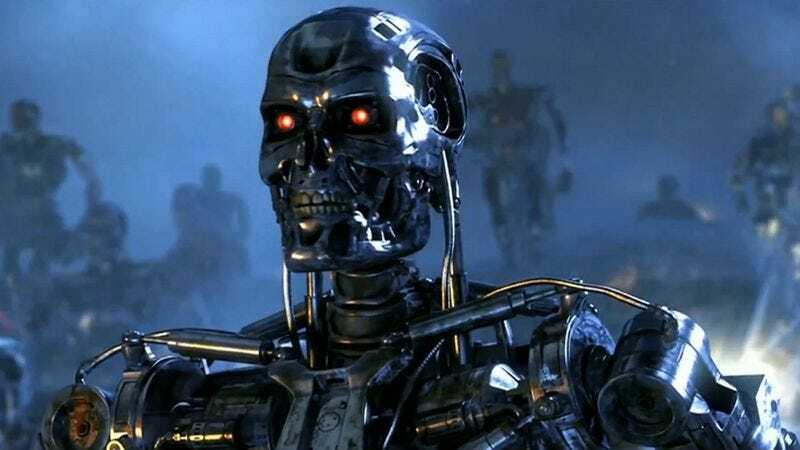 Will they create an army of war machines that hunt the few remaining human survivors to the ends of the Earth? Or will they do something entirely unexpected that even the fleshy, pink brains of our finest film directors can’t foresee? Feel free to use your own computer to discuss these questions below, unless you’ve already smashed it to pieces.